We’ve lived in our home for 11 years next month. My very patient husband requested a curtain be put up on the front window to replace the nasty shade that was there. The shade lasted for about 5 years and was discarded leaving uncovered glass. Tonight the inspiration hit. 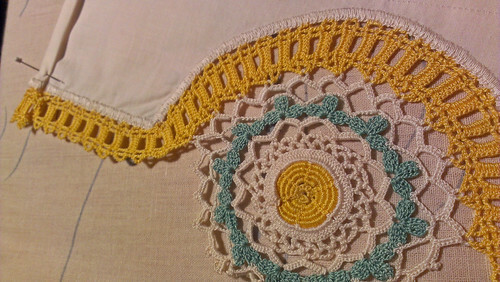 I had just been cleaning some of my piles in the basement and came across a beautiful bedsheet with hand crocheted lace attached. Scott’s great-grandma crocheted piles and piles of lace. The colors used on this sheet happened to be the colors used in our living room. Voilà! I am so pleased how it matches so well, and I’m sure Scott is glad that I finally got the job done with flare to boot. This is today’s official Art Every Day Month creation. I call it the art of repurposing. 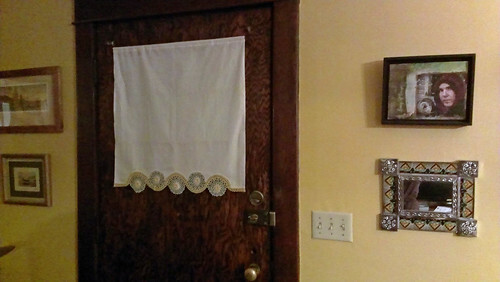 In sewing this simple curtain, I think I fell in love with my sewing machine again. It has been seriously neglected these past few years. Today I remembered all the reasons I loved it so, including that hum it makes when I step on the pedal full speed. I haven’t been posting much lately, I know. Last week’s shingles got me down for a bit, and this past week we shared Thanksgiving with family. I laughed so hard my eyes squinted shut and hugged so big that I left a part of my heart. And I am so thankful not only for my family, but for my health. Wishing you all a happy and grateful heart. how beautiful! i’m so glad you are feeling better, dear amanda. love repurposing and love the curtain and love that you are getting well! I love this! And, as always I love the woodwork in your house. I wish it was a part of our old farmhouse! It’s beautiful, Amanda. And I love this too about your sewing maching: “that hum it makes when I step on the pedal full speed.” I used to sew a lot but these days not so much. Whenever I get it out, though, I feel the way you do. Hope you are continuing to feel better. I know that shingles can be a real pain (literally and figuratively).